Why do you have a picture of someone flipping a swimmer the bird? physio has told me I need to speed up my cadence, he reckons I am probably loping along (he is probably right) and if I up the cadence then there will be less stress on my joints. MC - sorry, no tips. How about listening to music with a fast tempo and running in time? Nice to see it so lively in here. DJ - sending hugs to you too. My Dad has a motor nurone disease very simmilar to MS and has been ill for the past 29yrs. It's very tough. Jude - great pictures and well done again to Elif. Tomorrow we are going to be trying to entact the show because I'm taking the family to a nearby outdoor ice-rink. Will be Smidge's first time on skates and she's a bit nervous. As promised FINALLY able to upload the pic!! 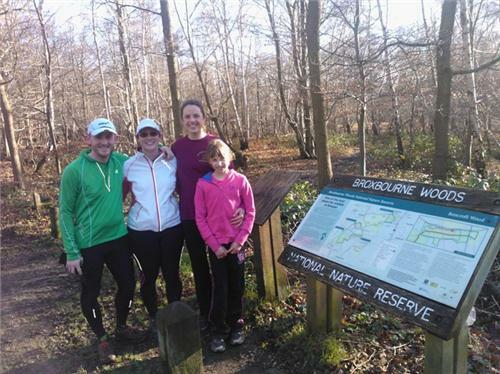 New Year's Day Run at Broxbourne Woods with Rocker, Liz, my honey 'Chili' and our little Chilibean 'Big Girl'. Celebration complete with Lemon Drizzle Cake followed the achievement. Thanks for all the kind words.Had some positive news on Mum today.They have found the reason for her lack of motivation,worsening physical state and terrible mood swings and depression.She has a bacterial infection,that has affected her brain.She is now being drip fed antibiotics and hydration,and is a bit more herself,although she is very very week,and still critical.If we can get her mind and fight back,she could recover,as her current state has been caused by her refusal to eat,drink or get out of bed.Hopefully she'll want to help herself to get better.Here's hoping anyway. Jude,great pics.It's always a joy to see youngsters enjoying sport. Fab noo years day meet photo too.Thanks Mr Chilli. Well i'm going to shame myself now.In April 2011,when i completed my marathon,i weighed 13st.After a 18 months of illness,injury and dealing with a lot of disruption to my life i now weigh 15st 5lbs.So i am aiming to get back to 13st by the end of the year.Training starts on Saturday,with club running starting a week later,and hopefully racing starting in April.No excuses,i've got to be fit and strong as a lot of people rely on me,and i need to enjoy my running again.I'm really looking forward to being able to be fit enough to join you on your long runs.Although maybe not the ultra ones just yet. Now i'm off to charge the Garmin,dust off my shoes,and try and remember my Fetch Everyone login details.The road awaits. Going cycling today to stop from bouncing off walls. DJ, sounds like you've had a really tough time. Hope 2013 is filled with wonderful things for you and good luck with the new programme. DJ - I do hope your mum feels better soon now they have a diagnosis. Louise - Enjoy your bike ride. DJ - good that they know what is wrong with your mum, hopefully she will make progress now, my thoughts are with you. Louise - thanks, I haven't been following the paris threads, now exactly sure how to do that but I will try! DJ, hope things get better with your mum now they know what they are dealing with. And good luck with the weight loss. I know how hard it can be. Funnily enough, that's my target, but I have a 12lb head start on you. Mornin' Anyone like some granola flapjack? DJ, really hope your mum improves. And big hugs to you as you dust off your garmin and trainers. We are all here to cheer you on. Does ice skating class as cross-training? Just had a wonderful 50mins with my girlies on an empty ice rink. Should be doing a bike ride today but am feeling very can't-be-bothered about getting my bike out. MC...good luck with upping your cadence...I would have no idea how to..sounds too technical to me...lol..I'd probably end up falling over thinking about what I and where my ankle etc should be. Deejay...hope your mum umproves soon and don't worry abiut the weight loss it will happen as you get back into your running routine again...good luck. Jude...what a lovely pic of your gilrlie...you must be a proud proud mummy...hoe you got your marking done. AF...hows you foot today Boss. No running for me today...I seem to have lost my get and go...can you help me find it pleez. There's a DVD voucher I've got that needs using: I might do a 'town to town' run for the first time in order to spend it. It's not outside my distance comfort zone, but I usually keep runs local - this'll be the first time going on a run outside my immediate area. Of course I could get the bus, but why do that when I can combine the trip with a run? that sounds like fun RR!! DJ-Fingers crossed for you and good to here that you have weight and running goals. Well I still have an achey achilles - I think it may be slightly strained so have been told to ice it and see how things go. Will see how things go,but, unlikey be going to running club- need to do 4.5 miles this week fro the 20 plus week No 99 so may weight until the weekend. MC hope the turbo session went well and that there were no more disruptions. well, feel better for having done the turbo. Don't really feel like runnng, so going to leave my run till tomorrow, have club swim later anyway. Yep, it was a worthwhile trip. I found I what I wanted (Jurassic Park Trilogy Steel boxset) and because it had gone down in price, I was able to get The Eagle as well for £1 - because that had also dropped in price - the voucher itself was for £10. Felt a bit sluggish on the run itself, but I think that was probably because I left straight after eating - note to self: that doesn't really work well. I didn't eat much though. It was fun though, it felt like a mini solo marathon. I want to strengthen my legs, so am going to add a hill running session to my routine. So it'll probably go something like: 'ordinary' run (around 5k) hill session (around 6 or 7k) and maybe a 10k to finish at the weekend. Edit: Well, the run might have felt a bit sluggish, but according to MapMyRun, I did it at an average pace of 05:54 (miles per minute I suppose?) That's faster than I've gone before. Woohoo lots of news from all you guys. Good shopping RR- love a bargain! dJ that's really good and encouraging news abt your mum, really hoping that she improves(((((hugs))))))) and yes young man- dust off that garmin. Boss, be careful and don't overstrain, gotta have our lead fast man fit. LouiseG- are you sure you are running? What you described sounds like a complicated recipe for drudgery !! No fun at all !! !